Florida State University-Panama, or FSU-Panama is an international branch campus of Florida State University located on the isthmus of Panama. FSU has operating a broad curriculum program in Panama City of the Republic of Panama for over 50 years. The campus, located by the Miraflores Locks of the Panama Canal, provides students with many facilities, including the largest English-language library in the Republic of Panama, computer facilities, research facilities, student housing, and athletic facilities. The student population is generally international and comes from the United States, the Republic of Panama and other countries. An international branch campus (IBC) is a form of international higher education whereby one or more partnering institutions establishes a physical presence in a foreign location for the purpose of expanding global outreach and student exchange. Generally named for their "home" institution and offering undergraduate and graduate programs, graduating students are conferred degrees from one or all partnering institutions, dependent on the agreement. Instruction most often occurs in properties owned or leased by the foreign institution, sometimes with a local partner, and may also include additional services and facilities to mirror Western universities. IBCs are delivered in many formats and currently exist all over the world. As a relatively new method of delivering post-secondary education, IBCs have been deemed successful and yet face continual criticism. The first campus was established in 1957  and served as an academic institution where U.S. military and Zonians located in the Panama Canal Zone could continue their education while staying in Panama. A Zonian is a person associated with the Panama Canal Zone, a political entity which existed between 1903 and the absorption of the Canal Zone into the Republic of Panama between 1980 and 2000. Many Zonians are descendants of the civilian American workers who came to the area during the early 1900s to work and maintain the canal. Today Zonians might work at the canal itself. Others may have been American citizens born in the Canal Zone or who spent their childhood there. A significant presence of American canal workers remained in the Canal region until 1999. The Panama Canal Zone was an unincorporated territory of the United States from 1903 to 1979, centered on the Panama Canal and surrounded by the Republic of Panama. The zone consisted of the canal and an area generally extending five miles (8.0 km) on each side of the centerline, excluding Panama City and Colón, which otherwise would have been partly within the limits of the Zone. Its border spanned three of Panama's provinces. When reservoirs were created to assure a steady supply of water for the locks, those lakes were included within the Zone. In the 1990s, the university was located in the Albrook 808 Building in a former U.S. Army Air Force station. Courses on international affairs, computer science, psychology, and economics were given. Most of the students were U.S. citizens or relatives. After Albrook was reverted to the Panamanian state, FSU moved to the Chino Panameno School, giving classes at night for people who worked from 1997 to 1999. The campus had various locations in Panama City, but was for many years located in La Boca (The Mouth), near the mouth of the Pacific entrance to the Panama Canal. 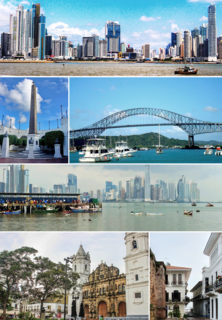 Panama City is the capital and largest city of Panama. It has an urban population of 880,691, with over 1.5 million in its metropolitan area. The city is located at the Pacific entrance of the Panama Canal, in the province of Panama. The city is the political and administrative center of the country, as well as a hub for banking and commerce. In summer 2009, the campus relocated to the Ciudad del Saber or the City of Knowledge,  a reverted area which was previously a U.S. Army base, Fort Clayton, but was closed in 1999 per the Torrijos–Carter Treaties. Panama's Ciudad del Saber is a government-sponsored cluster of academic organizations, technology companies and non-governmental organizations, managed by the foundation of the same name. It is located just across the Miraflores locks, in what used to be United States Army South headquarters, Fort Clayton. Fort Clayton was a United States Army base in the former Panama Canal Zone, later part of the Republic of Panama. The Torrijos–Carter Treaties are two treaties signed by the United States and Panama in Washington, D.C., on September 7, 1977, which superseded the Hay–Bunau-Varilla Treaty of 1903. The treaties guaranteed that Panama would gain control of the Panama Canal after 1999, ending the control of the canal that the U.S. had exercised since 1903. The treaties are named after the two signatories, U.S. President Jimmy Carter and the Commander of Panama's National Guard, General Omar Torrijos. FSU-Panama's new building before rehabilitation in the Ciudad del Saber. July 2008. The new campus in 2014. The library at FSU-Panama contains the largest collection of English-language books in the country. FSU Panama has its own student government association as well as its own student newspaper, the FSU Pananole. There are many other clubs and groups, such as the Mandarin Club and the Environmental Club. Vimeo Video of FSU-Panama Campus Interview with Rector and Vice-Rector. Shawnee State University (SSU) is a medium-sized, 4-year, coeducational, public university in Ohio. Established in 1986, Shawnee State is located in the city of Portsmouth in Scioto County, near the Ohio River. An open-admissions university with a faculty-student ratio of 15:1, Shawnee State is the second least expensive of Ohio's 13 state universities. Tallahassee Community College is an American state college, and is a member of the Florida College System. Tallahassee Community College is accredited by the Florida Department of Education and the Southern Association of Colleges and Schools. Its primary campus is located on a 270-acre (1.1 km2) campus in Tallahassee, Florida, United States. Istanbul Bilgi University is a university in Istanbul, Turkey, privately owned by US-based Laureate Education, which is a for-profit college corporation. In Turkish, bilgi means "knowledge" or "information". The COMSATS University Islamabad (CUI), formerly known as COMSATS Institute of Information Technology (CIIT), is a public university in Pakistan. It is a multi-campus university with its principal seat located in Islamabad. The University of Monterrey is a private Roman Catholic institution of higher learning located in Monterrey, Mexico. Ancón is a corregimiento in Panamá District, Panamá Province, Panama with a population of 29,761 as of 2010. Its population as of 1990 was 11,518; its population as of 2000 was 11,169. It is sometimes considered a suburb or small town within Panama City, northeast of the limits of the town of Balboa. Ancon Hill is also the name of a large hill that overlooks Panama City and once served as a form of protection from pirates and sea invasion. The township was originally located around this hill, and was created to house employees of the Panama Canal during its construction. As part of the construction effort, the historic Gorgas Army Hospital was founded and built on the hillside. The first ship to officially transit the canal, SS Ancon, was named after the district. The community continued to serve as housing for employees of the Panama Canal Company until 1980, when parts of it began to be turned over to the Panamanian government under the 1977 Torrijos-Carter Treaties. Modern-day Ancón is a corregimiento of Panama City, serving mainly as a residential area. The Gorgas Army Hospital building is now the Panamanian Oncology Hospital, primarily used for cancer research. The area also houses Panama's Supreme Court, just a few feet away from the Gorgas Army Hospital building, and several Smithsonian Tropical Research Institute buildings for research into tropical biology. Ancón is also a parish (parroquia) of the District of Panama, located in the Panama Canal adjacent area. The International Islamic University, Islamabad (IIUI) is a public university located in Islamabad, Pakistan. It was established in 1980 and restructured in 1985. Metropolitan College of New York (MCNY), formerly Audrey Cohen College, is a private, college in New York City. MCNY consists of three schools: The Audrey Cohen School for Human Services and Education, the School for Public Affairs and Administration, and the School for Business. The Virtual University of Pakistan, also known as VU, is a public university located in the urban area of Lahore, Punjab, Pakistan. Frederick Lynn "Rick" Jenks was a professor emeritus at Florida State University (FSU), having joined the faculty in 1971. As a member of the faculty of the College of Education, he designed and directed the internationally recognized doctoral and master's programs in Teaching English as a Second/Foreign Languages (TESL/TEFL), which he led for more than twenty years. Jenks served as major advisor for fifty doctoral dissertations and more than 300 master's degree recipients. He founded and directed The Center for Intensive English Studies (CIES) at FSU from 1979 to 2002. He was an adjunct professor at Flagler College, a Fulbright Senior Specialist, a legal expert witness in second language assessment and an advocate in the Florida legislature for public-school English language learners. He was born in Buffalo, New York. The Florida State University College of Social Work, is the social work school of the Florida State University. The College is the oldest in the state of Florida. About 917 students are enrolled, including undergraduates and graduate students, including Master of Social Work and Doctor of Philosophy-seeking students. All programs are accredited by the Council on Social Work Education. The Florida State University College of Fine Arts, located in Tallahassee, Florida, is one of sixteen colleges comprising the Florida State University (FSU). The College is ranked among the leading fine arts programs within the state, with award-winning theatre, visual art, interior design, and dance departments. In 2016, the College was ranked #69 on a national list of fine arts programs by U.S. News & World Report. Florida State University, Panama City is located 100 miles (160 km) from the original campus in Tallahassee. Beginning in the early 1980s. Since that time the campus has grown to almost 1,500 students supported by 21 bachelor's and 8 graduate degree programs. A full-time daytime program was introduced in the fall 2000 semester. Albrook "Marcos A. Gelabert" International Airport is a public airport located 1.5 kilometres (1 mi) west of the center of Panama City, in the Panamá Province of Panama. It is on the site of the former Albrook Air Force Station. Previously, the airport was located in the area of Paitilla Punta Paitilla, operating approximately 70 years until January 1999, when the airport moved operations to Albrook. The name was changed to honor the Panamanian aviator Marcos A. Gelabert, whose contributions to Panamanian aviation included founding Panama's first airline and first school for training pilots. The International University of Sarajevo (IUS) is a private university located in the capital city Sarajevo, Bosnia and Herzegovina. The university was established by the Foundation for the Development of Education in 2004-2005. IUS is open to students from all over the world, and the language of instruction and communication is English. It offers four year education according to Bologna system. ADA University (ADA) is a university established under the Ministry of Foreign Affairs of Azerbaijan in March 2006. By the decree of President, ADA was transformed into university in 2014. When founded as the Azerbaijan Diplomatic Academy the main objective was to train specialists for a diplomatic career in Azerbaijani foreign affairs, however its programs expanded and the name changed to ADA University. Its founding rector is Ambassador Hafiz Pashayev, who is a Deputy Foreign Minister of Azerbaijan and a former ambassador of Azerbaijan to the United States. Its present, dedicated campus opened in September 2012. Centro Escolar University Makati is a satellite campus of the Centro Escolar University in Manila. Its campus is in Makati.